Migration into the lower south of Colonial America, especially the Carolinas, developed slowly until 1718, when a long series of violent Indian wars finally ended. Most migration after that point was driven by the restricted access to western lands in Pennsylvania and New York. During the 1740s and 1750s, migrants from the Middle Colonies traveled down the Shenandoah Valley on the Great Wagon Road and settled in the western portions of present day North Carolina. These settlers, many of whom were Scotch-Irish and Germans only recently arrived in America, quickly filled the upland backcountry on the eastern slopes of the Appalachians and began looking for routes of access to the lands beyond the mountains. In addition to the Great Wagon Road several other important routes carried migrants into the Southern Colonies prior to the American Revolutionary War. The route of the King’s Highway trekked some 1,300 miles north and south between Boston, Massachusetts and Charleston, South Carolina. It was possible to travel this road by wagon. In most cases, the wagons could average about 20-25 miles per day. A traveler making the entire journey would have taken at least two months. Other important roads to the Southern Colonies were the Upper Road and the Fall Line Road. Both ran parallel to the King’s Highway, and were built in 1735 for the purpose of moving goods and people not only into the interior of the Virginia colony, but also into both Carolinas and Georgia. Generally these routes are defined as having their terminus in present day Virginia, North Carolina, South Carolina, and Georgia. LOOKING FOR A SPECIFIC Name, Place, or Keyword ?? Use the “Find” function in the Edit pull down menu. You can also access this function by holding down the Control key while pressing the F key (Ctrl+F) on your keyboard. Road Trip= link to the “Road Trip” page of this route. Image Gallery= link to the “Image Gallery” for this route. Map = link to a map of this route. Originally a Native-American path known to early settlers simply as the Augusta-Savannah Trail this route is one of the oldest roads in Georgia. This 125 route originally followed along the western side of Savannah River to Fort Charlotte and from there to Toccoa, GA where it connected to the Unicoi Road and the trail from Tugaloo-Apalachee Bay Trail. Most of the old trail is now underwater. An approximation of the route can be followed along the following Georgia state roads: 47; 104; 74; 72; and 77. The Buncombe Turnpike travelled along the French Broad River through North Carolina's mountains to what is now the state line between NC and TN. It was built between 1824 and 1828 along the old Drovers' Road. This route connected with the 19th century resort town of Hot Springs, NC and Knoxville, TN with eastern Piedmont communities. This Native-American pathway became one of the first used by European settlers to travel inland from the coast. Bermuda Hundred was settled by the English in 1613 and is situated at the confluence of the Appomattox and James rivers. Source: Myer, W.E. Indian Trails of the Southeast, www.gustavslibrary.com, Trail #47. European settlers began to use this route about 1732 to move inland from the coastal community of Charles Town (Charleston), SC. The pathway ended in Kershaw County, South Carolina. The length of the entire route was about 150 miles. South of Roanoke, the Great Wagon Road was also called the Carolina Road. This road stretched southward into the back-country of North and South Carolina with several branches linking with the coastal areas of the aforementioned colonies. These routes were originally Native American trails of the Great Indian War and Trading Path. Originally an Indian path, this trail connected North Carolina's European Yadkin River settlements with the Waxhaws settlements and the Lower Cherokee towns mostly in South Carolina. These eventually provided as much as 1/4th of the European settlers in what became Tennessee. The Catawba Path ran from Ichsua (Olean) on the Allegheny in New York through south through to Morgantown, WV. and on to the Carolinas, Kentucky and Tennessee and was one of the most important paths in North America. It was known by many names and its extensions served from Florida to Canada and the Mississippi Valley. The name for that portion of the Cherokee Path that ran from Charleston to Columbia, South Carolina during the colonial era. This trail was opened to European settlers about 1765. It connected Charleston with the British military's colonial Fort Charlotte located near the place where the Middle Creek Trading Path crossed the Savannah River between Georgia and South Carolina. Several other trails also radiated out from this fort. This historic road was essentially an extension of the King's Highway. It was opened to European settlers in the late 1730s. The length of the trail was about 120 miles (193 km). An early colonial route that was a segment of the King’s Highway. 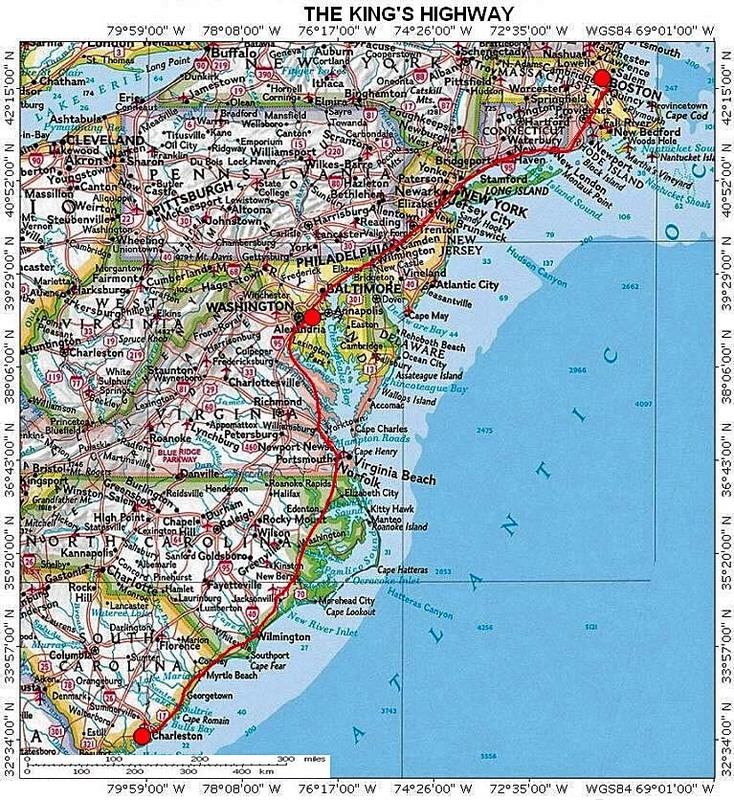 It ran along to Atlantic coast northeast from Charleston along what is now U.S. Route 17. This was another name for the Buncombe Turnpike. Soon after the road was built men called “drovers” led herds of animals to market along it. Every eight or ten miles along the road, there would be a “stand” where animals could be fed and penned outdoors and the men could find hospitality indoors. Although this route was used by all sorts of traffic, it gradually received the named of the Drovers’ Road. Built in 1735 this route runs parallel between the King's Highway and the Upper Road along a geographical feature, named the “fall line”, caused by erosion that stretches from Maryland all the way to Georgia. This colonial era route connected Fort Charlotte near the Savannah River with several Indian trails, especially the Old Cherokee Path and the nearby Indian town of Tugaloo. The length of the trail was about 70 miles. This Trail connected the colonial seaport of Charleston with Fort Moore then located on the South Carolina side of the Savannah River across from present day Augusta. Another name for the King’s Highway (MA/SC). Was a network of trails in eastern North America developed and used by Native Americans which ran through the Great Appalachian Valley. Also known as: Great Indian Warrior and Trading Path; Trading Path. See Great Indian War Path. The Path in Georgia connected with the South Carolina western branch at Augusta and an eastern branch ran from there about 125 miles to Savannah, where native-Americans went for salt and game. The path in NC had two major branches the east path went through Durham to Wilmington. The west branch traveled southwest through the Piedmont to present-day Mecklenburg County. Hillsborough established in 1754, Salisbury (1753), and Charlotte (1766) were established along this route. The Path forked near Charlotte NC going West through Rock Hill, Chester, & Newberry; and, East through Camden on animal salt trails, to present day Georgetown, SC. The Chesapeake branch was the main path through VA. It became the Great Valley Road and ran southeast through the Shenandoah Valley. The Richmond fork of this Chesapeake branch led off from Salem, and continued southwest of Lynchburg, and thence northeast to the site of Richmond of today, see Richmond Road. Another name for the Great Indian Warrior and Trading Path. This is another name for the Great Wagon Road that would be utilized when referring to the route used by migrants such as the Ulster-Scots and Germans who arrived in Philadelphia then made their way westward to Lancaster and Harrisburg, thence south over the Warriors Path towards the cheaper lands of Virginia. Refers to that segment of the Great Wagon Road which traversed the Shenandoah Valley of Virginia via present day US Route 11. Also known as the Valley Pike. Was a Colonial American thoroughfare from Pennsylvania to North Carolina and from there to Georgia. The southern segment of this route was also known as the Carolina Road. Also known as The Great Philadelphia Wagon Road. Ancient name for the Shenandoah Valley portion of the Great Wagon Road, also known as the Great Valley Road which follows the Chesapeake Branch of the Great Indian Warpath. See Great Valley Road. Another name for that portion of the Cherokee Path ending at Keowee a Cherokee town in the north of present-day South Carolina. Located on the banks of the Keowee River, Keowee was submerged beneath the waters of Lake Keowee when the river was dammed in a power project. Also known as the Old Cherokee Trading Path. About 1,300 miles in length. The portion between New York and Boston was first used in 1673 and is called the Boston Post Road. South from Alexandria, VA segments of the route were called the Potomac Trail and the Virginia Path south of Norfolk. Also known as the Great Coast Road. This Native-American path originally connected the Catawba Indian villages in the Waxhaws (Charlotte area) in North Carolina with Cherokee Indian "Lower Towns" in South Carolina and Georgia (Tugaloo area). This was the name for an ancient Native-American path from the village of Orapax (east of Richmond) to the western Shenandoah Valley. The later named Three Chopt or Three Notch'd Road followed this route. This Native-American trail started near the James River, and went through Ft. Henry (later Petersburg, VA), southwesterly to the Indian trading town of Occaneechi (Clarksville, VA), then to the Waxhaws (Charlotte, NC), and Cherokee villages of the Carolinas and Georgia. The length of the route was roughly 510 miles (820 km). Also known as the Upper Road in VA, Great Indian War and Trading Path in VA and NC, and Western Path in NC. Probably the first road laid out in Georgia, with the assistance of Native-American Tomochichi. This road was the 18th century migration route from the Potomac River to the Carolinas that traversed through central Virginia. It is probable that the old wagon road followed close to the route of US 15 to the North Carolina line, then angled southwest to Swepsonville (Burlington) NC, where it met the Great Indian Warrior and Trading Path. This ancient pathway connected the Lower Cherokee Indian villages, in particular Tugaloo and Keowee with several Indian trails, especially the Great Indian Warpath or Great Valley Road in Virginia. European settlers began to use this route during the American Revolutionary War. The length of the trail was about 150 miles (241 km). Also known as the Keowee Path. Source: Myer, W.E. Indian Trails of the Southeast, www.gustavslibrary.com, Trail #76. The primary routing of this colonial era road was about 215 miles in length. It connected Charleston with several important internal South Carolina towns as does current day Interstate 26. It had several branches that connected with the Catawba Trail and Old Cherokee Path. Ran from the present day Petersburg probably along the Appomattox River by way of Farmville to Saponi Town on the Otter River in Campbell Co., VA. This early pioneer migration route was another name for that part of the Virginia Path, and the King’s Highway to the Albemarle Sound in North Carolina. This segment is about 40 miles in length. Today this route generally follows VA State Route 32 in Suffolk Co., VA, and NC Highway 32 through Gates and Chowan Counties in NC. Source: Myer, W.E. Indian Trails of the Southeast, www.gustavslibrary.com, Trail #51. This early pioneer migration route from Virginia to North Carolina is about 50 miles in length. The possible ending is where present day US Route 258 crosses the Roanoke River. Source: Myer, W.E. Indian Trails of the Southeast, www.gustavslibrary.com, Trail #50. This early pioneer migration route from Virginia to North Carolina is about 100 miles in length. It is part of the Occaneechi Path from Petersburg to the Meherrin River. It then travels east of the Occaneechi Path until it reconnects to the Occaneechi Path where intersects the Tar River in Granville County, NC. Source: Myer, W.E. Indian Trails of the Southeast, www.gustavslibrary.com, Trail #49. The opening of this wagon road 1746 greatly influenced the migration of people from the Tidewater areas of Virginia to points west and southwest. The Pioneer's Road permitted wagon traffic from Alexandria, Virginia to cross the Blue Ridge Mountains and intersect with the Great Valley Road at Winchester the westernmost town in Virginia at that time. The route follows very close to that of the modern U.S. Hwy 50, which crosses the Blue Ridge Mountains via Ashley's Gap. Probably the oldest segment of the King’s Highway in the South. The Potomac Path ran through Alexandria, VA.
An early western migration route from the James River to the Great Wagon Road. This historic route dates back to at least 1648 when Bartlett’s Ferry was established to carry traffic across the Chickahominy River. Today VA State Route 5 follows the 55 mile route between these two historic communities. Some of the largest and oldest James River Plantations are along the route. This old road from Columbia, passed through Newberry and Greenville districts to the Blue Ridge Mountains at the Saluda Gap. Also known in upper South Carolina as the State Road and in North Carolina as the Buncombe Road and later the Buncombe Turnpike. This Native-American trail was utilized to connect the Saura tribe in the Carolinas and their close cousins the Saponi tribe in northern Virginia. The route closely parallels U.S. Route 29 between the Rapidan River in Virginia, and the Yadkin River in North Carolina. Source: Myer, W.E. Indian Trails of the Southeast, www.gustavslibrary.com, Trail #46. This colonial route was a parallel alternate to the King's Highway. It is most likely that white settlers began using the route in the 1730s or 1740s. The length of the road was about 475 miles (764 km). Alternate routes to the King's Highway in the north apparently did not carry the name "Secondary Coast Road" in places north of Petersburg, Virginia. Another name for the Saluda Gap Road, and Buncombe Turnpike. Another name for the Fall Line Road. During the colonial-era this was a major east-west route across central Virginia. By the 1730s, the trail extended from the he future site of Richmond westerly to the Shenandoah Valley. Today, a large portion of U.S. Route 250 in Virginia follows the historic path, as does nearby Interstate 64. Also known as Three Chopt Road. The Trading Path was a corridor of roads and trails between the Tidewater region of Virginia and the Cherokee, Catawba, as well as other Native-American groups in the Piedmont region of North Carolina, South Carolina, and Georgia. Also known as The Path to the Catawba, Catawba Road, Warrior’s Path, Occaneechi Path. In colonial times one of the most important north-to-south travel and trade routes that closely followed much of the Native-American Occaneechi Path. Use of this route started around 1740 as an alternative route to the Fall Line Road. Also known as the Carolina Road. Traditional name given for the Indian trail and Great Wagon Road which now is designated as U.S. Highway 11. In 1834, The Valley Turnpike Company was incorporated to build 68 miles (109.4 km) between Winchester and Harrisonburg. It merged with a similar road built to Staunton. The new combined road charged tolls for the upkeep of its 93 miles. This route was also known as the Valley Turnpike. That segment of the King’s Highway south of Hampton Roads to the Albemarle Sound. This trail connected the mouth of the Cape Fear River with Native-American settlements in central North Carolina. It intersected the Occaneechi Path near present day High Point, NC and connected with the Occonee Path near present day Winston-Salem, NC. Source: Myer, W.E. Indian Trails of the Southeast, www.gustavslibrary.com, Trail #88. Source: Myer, W.E. Indian Trails of the Southeast, www.gustavslibrary.com, Trail #116. During our research we have collected images and photographs that are of general interest to a variety of historic American roads, trails and migration routes. Some of them are presented on this website because we believe they tend to provide the reader with additional information which may aid in the understanding of this topic as well as our ancestors past lives. Gallery” that pertain to this topic. you are searching in the box and click “Search Images”. At the “Images” display page you will see the image, as well as the website of which it is associated. assist your research about this topic. The following Link will take you to our library of genealogy reference books. Here you will find books about historic American roads, trails, and paths. In addition, there are texts that pertain to ethnic and religion groups, history, geography as well as other books that will assist you with your research.